“Having an interest in the paranormal from a young age, I’ve always been drawn to the idea of haunted items. Probably sparked, in part, from the theme explored in horror movies, such as The Possessed, Child’s Play, and Annabelle. Literature isn’t too rich in the subject when it comes to haunted items so I was intrigued when I saw a new release by author Anthony Quinata, called Harold the Haunted Doll. I have since learned that this doll, which is believed by many to be haunted or cursed, already has quite a following after an appearance on the ghost hunting series, Ghost Adventures (Island of the Dolls episode). 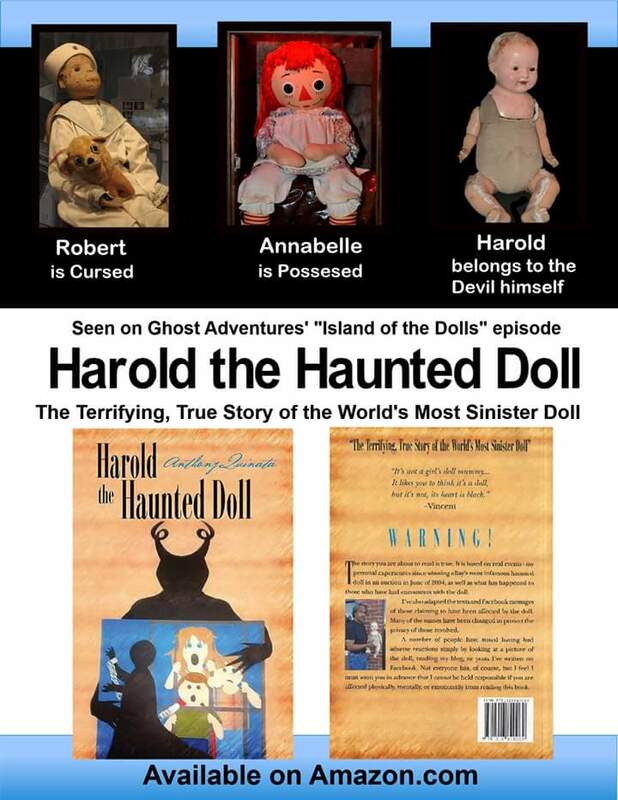 Many people have followed Harold’s story over the internet and on television, and even reported being affected negatively after being exposed to pictures and stories regarding the doll. To read the entire interview, click here – Study Paranormal. Do I buy antiques since Harold the Doll? Anthony, great interview! Can’t wait to read the book! By the way, does it make you think twice before purchasing an old, antique item on eBay? Has it changed your buying techniques and made you more cautious? I have a number of “active” antiques now, but they’re typically given to me by people who know about Harold. LOL The last one is an old radio that the head of maintenance found in one of the rooms left by a former guest at the hotel I was staying at. When he left, he left the radio behind and told me I could have it. Honestly, I didn’t believe there was anything to it, but I put it in my storage unit with all my other things as well. We then looked around to see if there was someone else around with a radio playing but we were the only two in the facility. These days, while I love, and like looking at, antiques, I rarely, if ever, buy any.